Most social media tools just focus on one simple task, for example, scheduling social media content or collecting all of your social media statistics in one place. Social monitoring tools, even though their application may seem straightforward at first glance, have huge potential to be used for different purposes. You can build your social listening strategy in a way that will cover all your business needs, from product development to closing sales. All you need is to choose the right social listening tool. The right one, not the best. The “best” social listening tool doesn’t exist (sorry for accidental clickbait) because the best will always depend on your needs and resources. 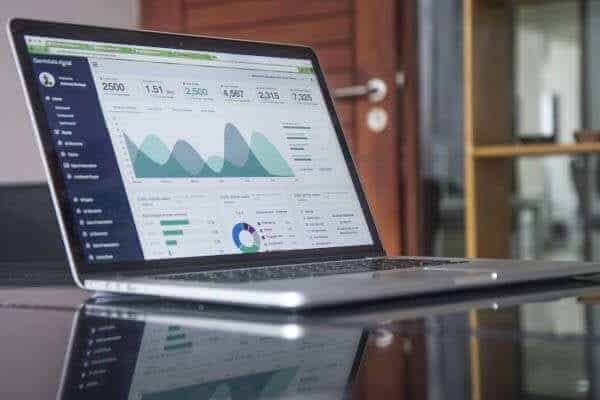 Here’s a list which compiles 15 very different tools which will help you gain a deeper understanding of social monitoring tools and choose something for your business. Platforms monitored: Twitter, Facebook, Youtube, Reddit, Instagram, blogs, forums, news articles, the web. 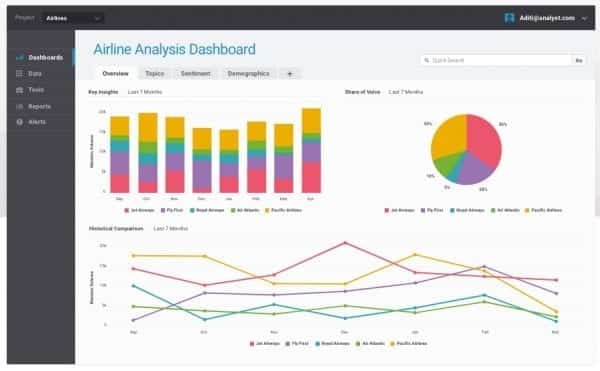 Features: analytics dashboard, sentiment analysis, influencer search, social selling module, Boolean search. Pricing: starting at $29 per month, $290 per year. Free trial: two-week free trial. Awario is one of the newer players on the market. This fact probably influences its price, making it one of the most affordable social monitoring tools out there. At the same time, it provides all the social listening power that Enterprise-level tools have. Awario allows you to monitor the mentions of your own brand, as well as your competitors, industry buzzwords, specific campaigns, events, products, etc. Historical data will help you identify trends in your industry. Besides reputation management, you can use it to provide immediate customer support, find linkless mentions, monitor backlinks and so on. Moreover, it offers a sophisticated search mode based on a Boolean data type, which allows you to design intricate queries to satisfy your specific monitoring needs. What differentiates Awario from any other tool on the market is a unique social selling module called Awario Leads. It finds people who might be interested in your brand by looking for social posts which ask for recommendations or alternatives to your competitors. Platforms monitored: news sites, forums, blogs, Twitter, Facebook, Instagram. Features: Brandwatch Analytics, Brandwatch Vizia, Brandwatch Audiences, Image Insights, Boolean search. Pricing: starting at £500 per month. Free trial: demo on request. Brandwatch is a tool designed with high-level professional marketing departments in mind and aims to aid big corporations. It’s one of the most multifaceted and robust listening tools in terms of social data analytics, which leads to it being one of the most expensive ones. Besides typical social listening features, Brandwatch offers image recognition, demographic data about your audience, trending topics in your niche, API access, and dashboards that can be exported into customizable PowerPoint presentations. Moreover, to make social monitoring even easier, Brandwatch added AI which recognizes trending topics relevant to your industry without you looking through endless amounts of data. The tool also has a separate data visualization platform called Vizia. 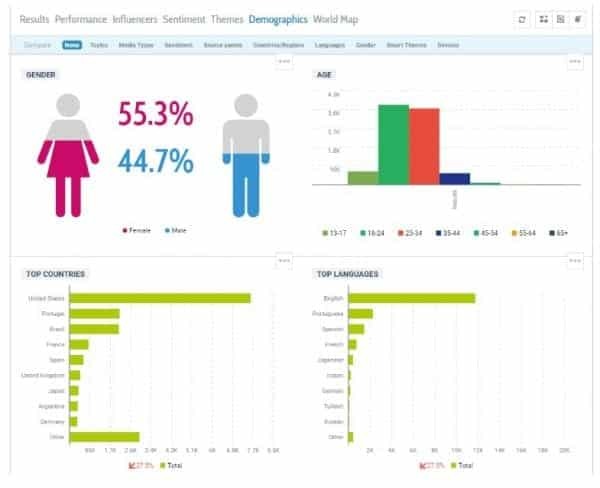 It lets you visualize the data collected and analyzed by Brandwatch and combines it with insights from a number of several other platforms (including Google Analytics, Buzzsumo, and Hootsuite). Platforms monitored: Facebook, Twitter, Instagram, YouTube, news and blogs, the web. Features: influencer discovery, integration of the reports. Pricing: starting at $29 per month, $300 per year. Mention is one of the classical social media monitoring tools from way back then. It specifically concentrates on immediate results — after putting in your keywords and setting up an alert you’ll get mentions from the last 24 hours. Historical data is available on request under the Custom Plan only. Mention allows integration by API for users who want to customize the tool according to their needs. It gives you access to Mention’s crawler and allows you to integrate features and collected data into already existing products. As for data visualization, Mention offers a separate dashboard where you can present data in different ways including line charts, pie charts and bar graphs. It compiles and sends out automated reports which update you on what’s happening with your alerts regularly. Platforms monitored: blogs, forums, news sites, Twitter, Facebook, Instagram, Youtube. 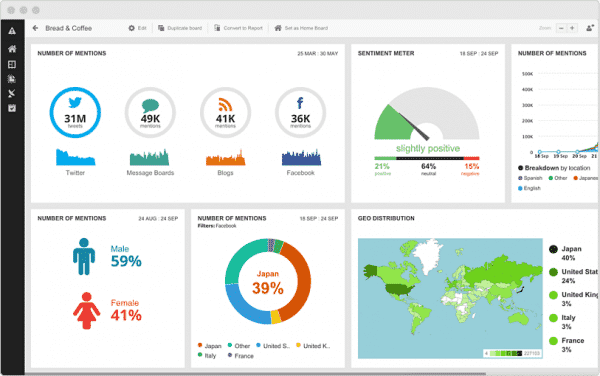 Features: sentiment analysis, demographics insights, content themes identification. Pricing: freemium, paid features pricing starts at $9,600 per year. Free trial: personalized demo available on request. Talkwalker is another Enterprise-level solution that fits big brands and agencies best. Just as with Brandwatch, it focuses more on analyzing social data rather than interacting with mentions one-by-one. The tool offers various ways of working with data including Demographics dashboard which provides users with target audience by age, occupation, languages etc. The themes feature visualizes popular topics relevant to the keywords you monitor in a tag cloud. Platforms monitored: Facebook, LinkedIn, Twitter, Pinterest, blogs, articles and the web. Features: content insights, influencer discovery, advanced filtering, content alerts. Pricing: starting at $99 per month, $948 per year. Free trial: free 7 day trial on the Enterprise Yearly Plan. 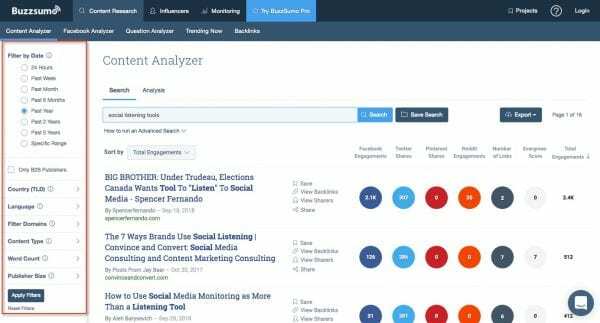 Recently acquired by Brandwatch, BuzzSumo is unique because of its emphasis on content and influencer marketing. It uses social listening to determine which content is performing best on social media, gives you recommendations on your own content creation and promotion, and lets you identify content trends. As for influencer marketing, it searches for key influencers in your topic area and shows you the content and topics they share most often, as well as the domains they share. It also provides Competitor Analysis which gives insights into your competitors’ marketing strategy and allows you to compare your content performance with rivaling brands. Platforms monitored: Facebook, Twitter, Instagram, Sina Weibo, websites, forums. Features: demographic analytics, sentiment analysis, emoji cloud. Pricing: starting at €490 per month. Free trial: free demo available on request. Linkfluence provides social data analysis for big corporations. Besides monitoring your brand, it’s able to reveal words associated with your brand and understand their importance and impact, as well as analyze your competitors’ most used hashtags and topics. The image recognition feature differs Linkfluence from most platforms. Its technology is able to analyze images, logos, and emojis in social posts. Features: keyword cloud, customizable and embeddable reports. Pricing: starting at $199 per month, $1788 per year. Free trial: 3-day free trial. Keyhole is an Enterprise-level tool which combines two types of analytics. It monitors and analyzes your mentions as well as gathers all your social media statistics from respective platforms in one place. As a result, you are able to see the full picture in one place: how many people are talking about you, how they engage with the content you share, how your social media following is (hopefully) growing. With Keyhole, you don’t interact with social mentions but rather discover trends, insights, and analysis of your preferred hashtags, keywords, or accounts. Keyhole offers a bunch of ways to present analyzed data such as keywords clouds, white-label reports, mention maps, historical reports, and an online dashboard that can be embedded on your website or shared. Platforms monitored: Twitter, Facebook, Instagram. Features: content insights, competitive analysis, automated insights that highlight what’s important. Pricing: freemium, paid features pricing starts at $49 per month. Free trial: trial on request. 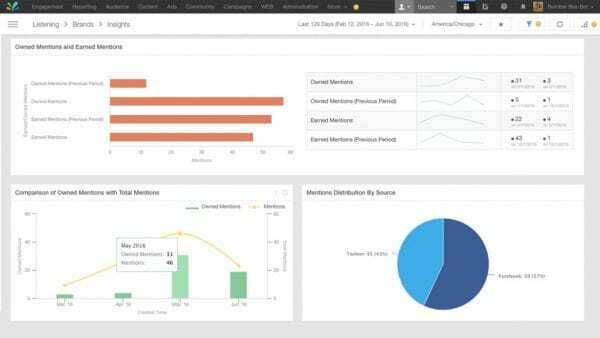 For starters, Union Metrics presents itself as a tool designed for marketing teams. 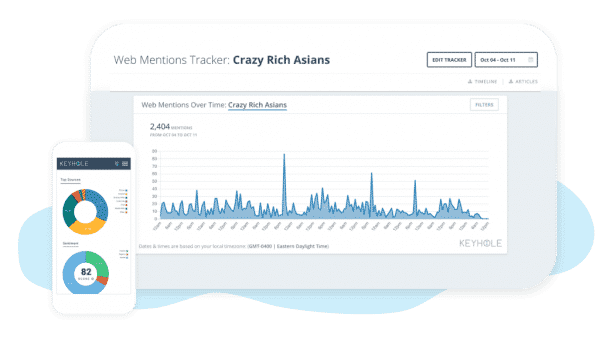 It’s a tool with a heavy strong focus on analytics: besides gathering social data from mentions, it also analyzes your own social media profiles. The tool offers you insights into what content performs best, when it’s best to share it, and how to adapt your content to different social platforms. Union Metrics allows you to monitor Twitter in real time, as well as gives you access to historical data for research purposes. 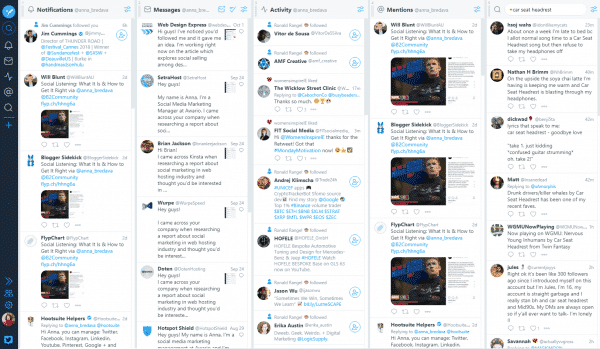 Tweetdeck is the official Twitter platform for managing your accounts. It’s a social media dashboard which typically shows you Tweets from people you follow, trending Tweets and your account’s direct messages. Apart from gathering everything in one dashboard, Tweetdeck also lets you schedule your Tweets. You can also set up separate fields for monitoring keywords and hashtags of your choice. In this case, you get access to Twitter’s search functionality, and you can customize the monitoring by using language and location filters, negative keywords, and date ranges. You can interact with the mentions on behalf of any of the Twitter accounts you connected to the app. Pricing: starting at $15 a month, $120 annually. Free trial: available with limited functions. 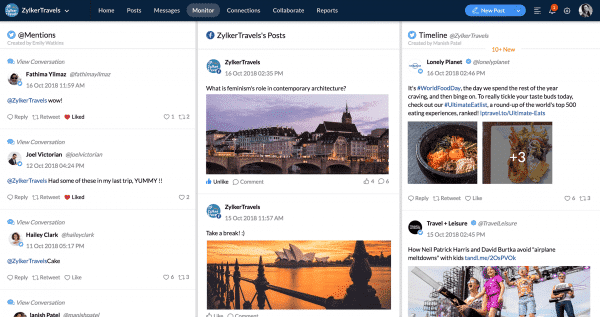 Tailwind is specifically designed to manage social media platforms which rely on visuals — Instagram and Pinterest. It schedules your content, monitors your own social media profiles, and gives you recommendations on your social media strategy. Regarding monitoring, it enables you to track keywords and hashtags on Pinterest and Instagram. You can use social listening to find untapped opportunities with related hashtag research and suggestions. Tailwind also deploys social monitoring to find Instagram influencers in your topic area. Features: publishing, sentiment analysis, Smart Research (related topics discovery). Free trial: 30-day free trial. 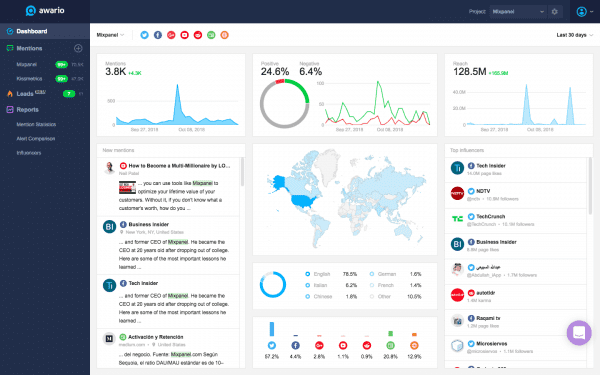 Sprout Social offers both social media management and monitoring in one tool. It allows you to schedule your posts, engage with mentions right from the platform, and monitor keywords and hashtags. It gathers all the social data in one place and analyzes it in order to give you valuable marketing insights. 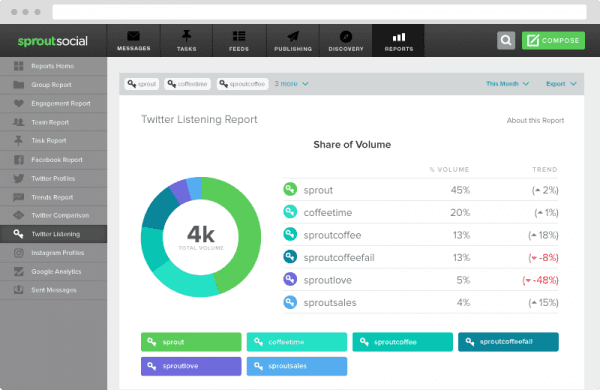 Sprout Social divides the social listening process into two separate features for monitoring and engagement. All your tagged social mentions are available in the Smart Box, and Discovery Feature lets you monitor a specific word or hashtag on Twitter and Instagram. Platforms monitored: Facebook, Twitter, Instagram, Youtube, Tumblr, Renren, Flickr, WordPress, blogs, the web. Features: Smart Alerts, team management. and a Social Listening feature. It’s designed for big teams and constant monitoring, which is made possible with a mobile app, custom alerts, and automated report exports. For enhanced reputation management, Sprinklr uses machine learning to identify unusual and potentially harmful trends and alerts you in real time. It analyzes social data and presents it in several ways which you are able to customize. The historical data going up to two years back is available on demand. Features: publishing, sentiment analysis, search by location, integration with other social monitoring platforms. Pricing: starting at $19 per month. Free trial: 30-day free trial, billing information required. Hootsuite is another one of the oldies-but-goodies tools which combine management and monitoring. 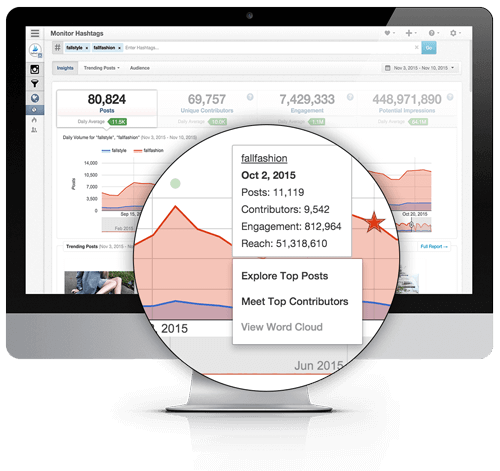 With Hootsuite, you can set up unlimited social streams to monitor a number of topics. You can search both by keywords and locations. 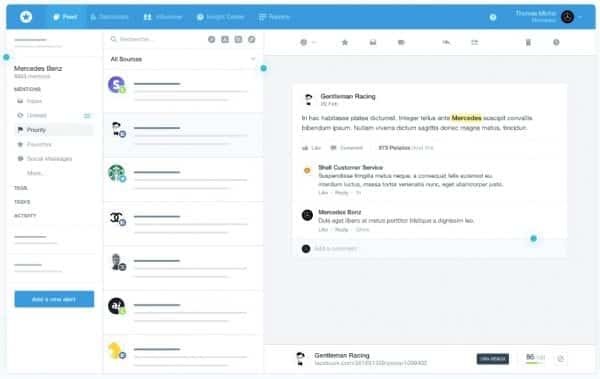 Hootsuite also allows integration with other monitoring tools such as the aforementioned Brandwatch or review monitoring tools Reputology and ReviewTrackers. Signals feature shows you the best performing content which contains your keywords. This will help you identify the hottest topics in your industry or the influencer who mentioned your brand. Features: customizable dashboard, mobile app. Pricing: starting at $10 per month, $100 per year. Free trial: 15-day free trial. Zoho is primarily a management platform which offers social listening features. It’s best for teams who don’t have the need or resources to engage in a long-term social listening strategy. Zoho gathers all your tagged mentions from various social media platforms in one place and enables you to interact with them right from the platform in real time. It saves your interactions with users and displays them when needed. As for untagged mentions, you can monitor your brand and other keywords. 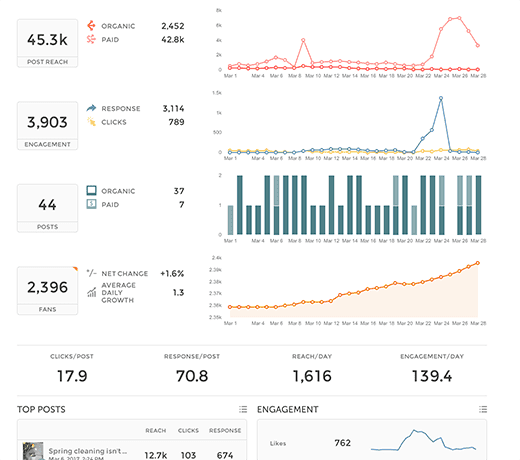 The dashboard is customizable, so every member of your social media team is able to personalize their screen. Platforms monitored: Facebook, Twitter, Instagram, Foursquare, Weibo. Pricing: freemium, price on request. IFTTT stands out from this list because of its distinctive technology. It’s an automation tool which can be customized to do whatever you want (the name speaks for itself, If This Then That). IFTTT operates in some kind of commands called applets, which you can use to combine social media platforms with various services. You can choose which applets to add to your dashboard, so you can select which platforms you want to monitor. Since IFTTT is not a social media monitoring tool and is not even a social media tool per se, its functionality is not as sophisticated as some other tools’. Using IFTTT, you can gather mentions of your brand, keywords or hashtags into one place like Google Spreadsheet, for further use. The strength of IFTTT is its flexibility and the ability to be used for multiple purposes. Social media is one of the best sources to look into to get to know your audience, your competitors, and your industry. With a social monitoring tool, you get access to a huge pool of opinions and views which are voluntarily shared on the Internet. If information is power, social media is one of the biggest power sources in the world. However, with great power comes great responsibility, and in this case, the responsibility falls on the tool you choose. Whether you’re an entrepreneur, a marketing agency, or a part of the social media department of a huge corporation, there’s a tool for you. Think about what you have and what you need, and choose accordingly. Hanna Bredava is an expert on Social Listening. Hanna is a Social Media Marketing Specialist at Awario. She writes about social listening, social selling, small business marketing and tools that help anyone interested in marketing. Thanks for your suggestions on these popular social listening tools. I have been using HootSuite and BuzzBundle. These day, I could see Awario everywhere. I don’t have experience with other tools. It’s time for me to move on. Hope, I can try Awario. Social monitoring tools are best to use, specially, in holiday season it’s features help us to understand our social campaigns in easy way. I have used Brandwatch and Zoho Social for my social monitoring. I am glad for this tools list, to have some new tools handy, always help. Some really good in formation shared with all of us. Keep up the good work.